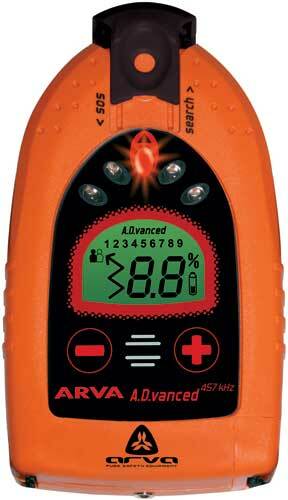 The ARVA Advanced was discontinued in 2009. Summary: The ARVA Advanced is both analog and digital avalanche transceiver (hence the interesting capitalization of ADvanced in much of the literature). It is otherwise very similar to the Evolution+ except as noted below. The ARVA Advanced was replaced by the ARVA 3Axes in late-2009. Searching: Digital searching is identical to the Evolution+. However, if you press and hold both the "-" and "+" buttons for two seconds, the transceiver switches to analog mode. You can then use the "-" and "+" keys to modify the sensitivity of the analog signal (similar to a classic analog beacon). This is a quick and easy way to change between modes. If you are an old-school analog rescuer or prefer analog mode when searching for multiple victims, the ability to switch to analog mode is great (and is similar to the Barryvox 3000, the Ortovox S1 (but not the S1+), and the Mammut Pulse). The BeaconReviews.com range chart displays two ranges for beacons that have both an analog and digital mode. Multiple Burials: The multiple burial feature in the ARVA Advanced was updated for the 2007/2008 season. The ARVA 3Axes uses the same technique. When multiple signals are received, the icon appears on the screen and the transceiver locks onto the closest victim. After locating the first victim, you can "suppress" (aka, "block") the current victim's signal by quickly switching from search, to transmit, and then back to search (by toggling the "nose" switch). The Advanced then directs you to the next victim. This feature worked well in my testing of the ARVA Advanced. You can learn more about searching for multiple victims in the user's manual. Optionally, you can toggle the Advanced to analog mode and then use the analog tones to find multiple burials (this takes significant practice). Controls: To turn on the Advanced, you connect the wrist strap to the transceiver (versus the Evolution+ which turns on when the harness is connected). Changing to search mode is unusual, but simple (you pull the "nose" of the beacon). Comfort: The Advanced's harness is different than the Evolution+ (the Evolution's harness is required to turn the unit on whereas the Advanced slides into a pouch on the harness). Both harnesses comfortably position the transceiver. Other: Some other reviewers (and the manufacture's literature) say that the ARVA has faster processing than other transceivers. The processing seemed similar to the Tracker DTS and little faster than the Pieps DSPs, but I did not attempt to quantify the differences. Pros: Toggles between analog and digital.